These Marshmallow Leprechaun Hat Cookies are a cute and delicious St. Patrick’s Day treat – perfect for kids school parties, gifting, or to enjoy at home! If you’ve been following our blog for a while, you might have noticed that the girls and I love to make chocolate-dipped goodies for just about every holiday! (Like these Conversation Heart Marshmallows for Valentine’s Day and these Spiderweb Cookies for Halloween). 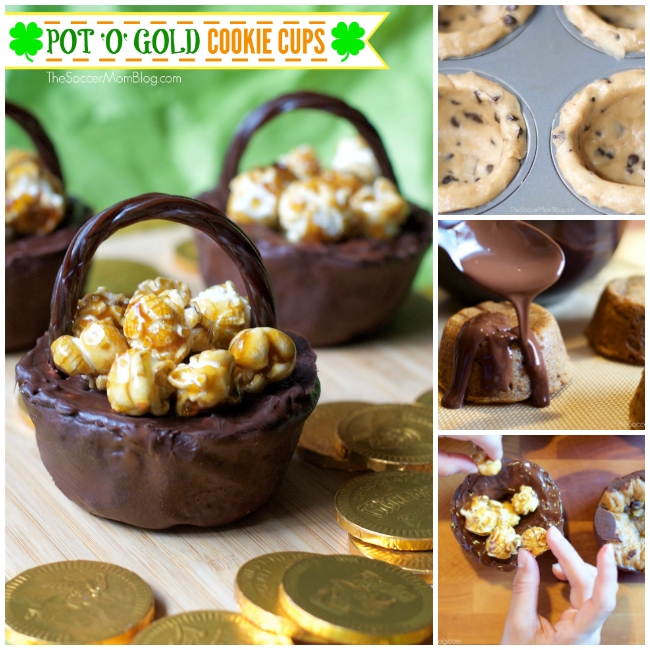 So of course we had to create something for St. Patrick’s Day! 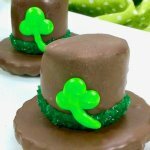 These Chocolate Marshmallow Leprechaun Hats turned out absolutely adorable! They’ll really stand out on your party table, or they make a fun treat to take to a school party. You can even put them on a stick to make Leprechaun Hat Pops! This is a quick list of shop-able ad links to help you locate products used to make this recipe; full ingredient amounts and directions available at bottom of post. (Read our disclosure policy here). Keep reading for photo step-by-step instructions and video tutorial or click here to jump to printable recipe. 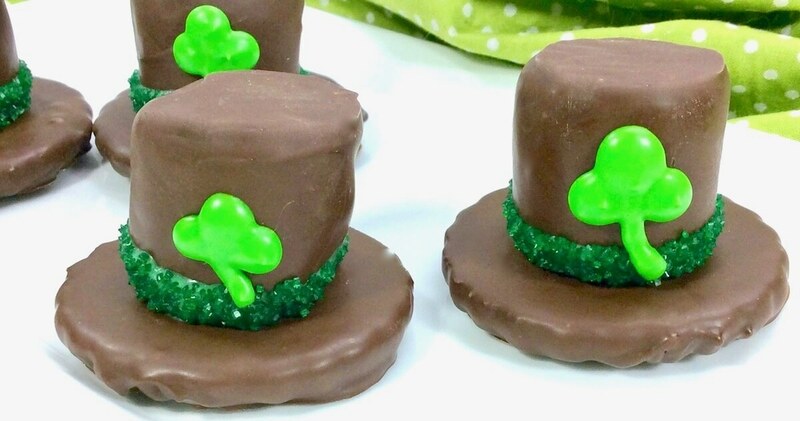 First, watch a 1-minute recipe video to see exactly how we made our Marshmallow Leprechaun Hats, then keep reading for photo step-by-step directions and prep tips! First, melt your chocolate using a double boiler, or in the microwave. Be sure to use a microwave-safe bowl, stir every 20 seconds, and handle with care as bowl and contents may become hot. 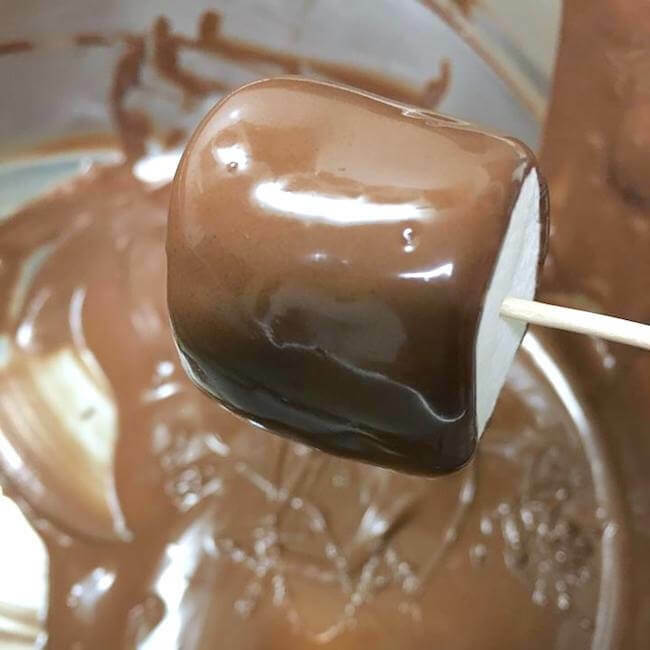 Use a toothpick to dip each marshmallow into the chocolate and rotate until almost fully coated. Leave a little of the marshmallow uncoated around the toothpick because you will dip this side in green later. Allow marshmallows to dry completely on parchment paper or non-stick Silicone Baking Mat. TIP: Place marshmallows in the fridge to speed up the setting process. While marshmallows dry, coat your cookies in chocolate. Dip each cookie into the melted chocolate, one-by-one, flipping with a fork to ensure that the entire cookie is coated. Allow excess chocolate to drip back into the bowl before placing cookie onto parchment paper or non-stick Silicone Baking Mat to dry. Tip: Chopsticks also work great for this step! When marshmallows are set, melt your green chocolate. 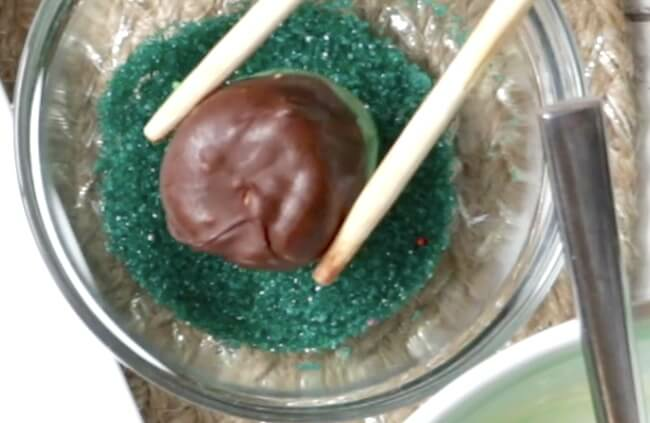 When the green candy melts are partially melted, mix in the coconut oil. This will thin out the candy melts so that your mixture becomes smooth. 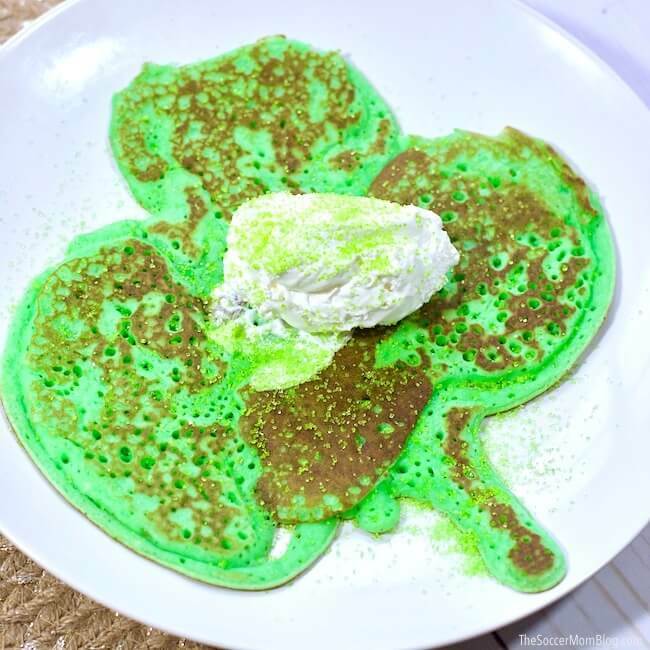 TIP: You can also use melted white chocolate dyed with green food coloring for this step. Pour the green sanding sugar in a small bowl. Dip the bottom of each marshmallow (which is still uncoated) into melted green chocolate. Allow excess to drip back into the bowl. Next, dip each marshmallow into the green sprinkles and press on top of the chocolate-covered cookies you made earlier. Repeat until all marshmallows are dipped in green chocolate and sprinkles, and attached to a cookie. They should look like leprechaun hats now. Allow to dry for about an hour. While the leprechaun hat treats are drying, scoop the remaining melted green chocolate into a plastic piping bag. 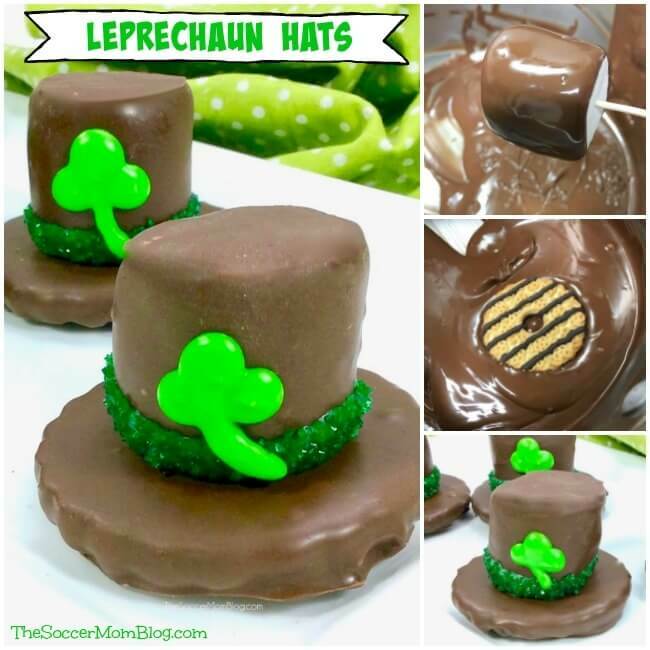 By the time your leprechaun hats have dried, you may need to re-melt the green chocolate. Once the green chocolate is melted, cut the tip off the end of your piping bag (about the size of a pencil tip). Pipe on 3 dots onto the middle of each hat. Using a toothpick, drag the dots together so that you can connect them and make a shamrock. Finally, draw a line of green chocolate from the bottom of your shamrock to create the stem. Let the chocolate harden for 30 minutes before enjoying your Leprechaun Hat Cookies. If you love this recipe, rate it! Or tell us what you think our Marshmallow Leprechaun Hats in the comments below. These Marshmallow Leprechaun Hat Cookies are a cute and delicious St. Patrick's Day treat - perfect for kids school parties, gifting, or to enjoy at home! Using a double boiler, melt the Ghirardelli melting chocolate and mix with a rubber spatula until smooth. 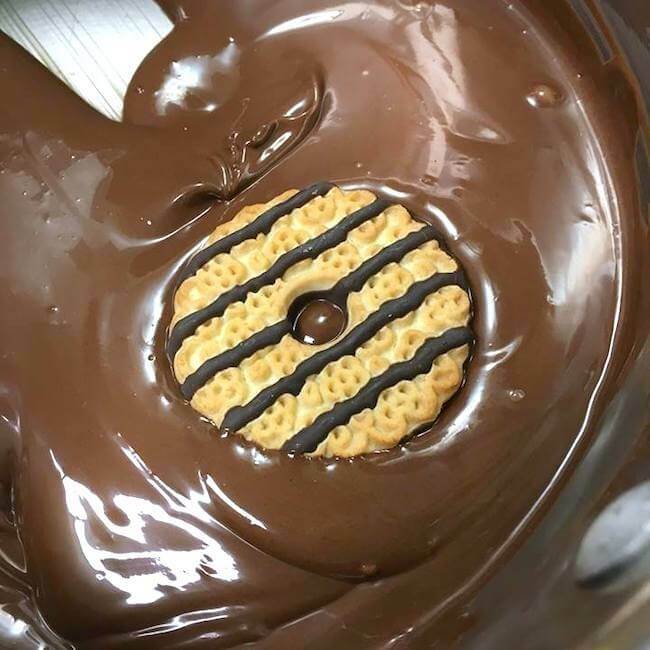 Dip each marshmallow almost fully into the chocolate. (You will still want to see a little of the marshmallow where the toothpick is because you will dip this side in green). Allow marshmallows to dry completely on parchment paper or silicone baking mat. While marshmallows are drying, coat your cookies in chocolate. 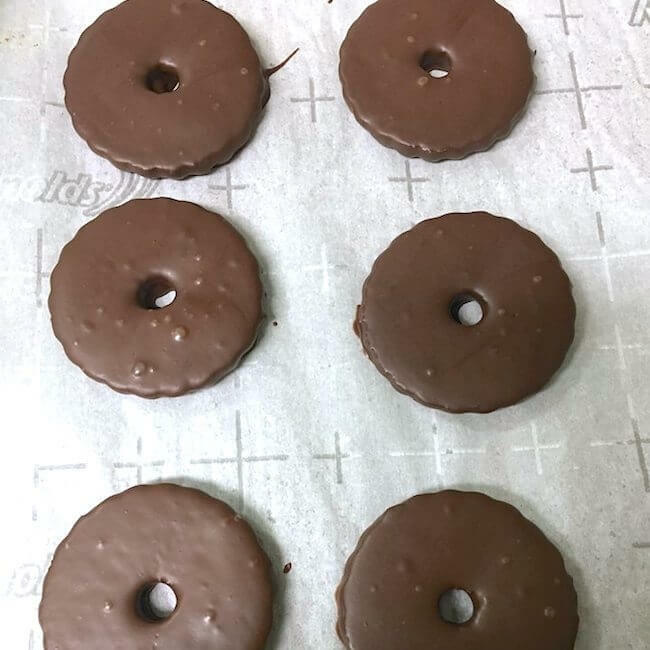 Dip each cookie into the melted chocolate, one-by-one, flipping with a fork to ensure that the entire cookie is coated. Allow excess chocolate to drip back into the bowl, then place cookie onto the parchment paper (or non-stick silicone baking mat) to dry. Repeat until all cookies are coated in chocolate. 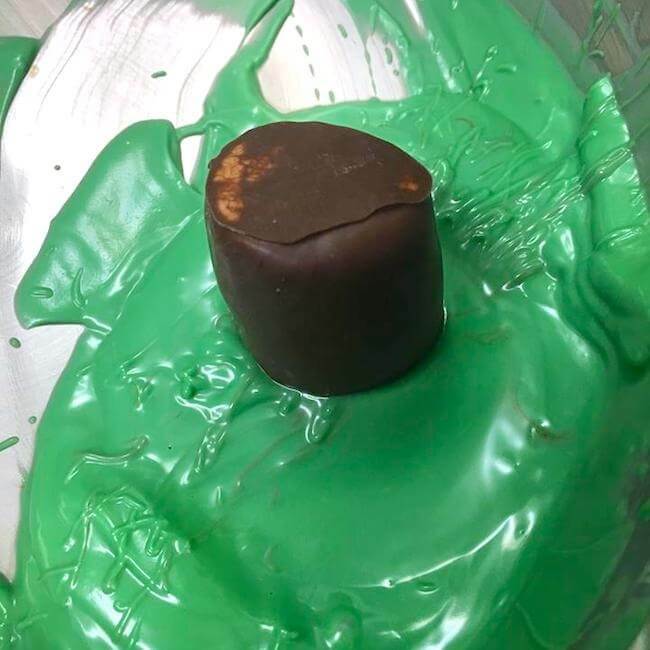 Melt green chocolate in double-boiler or microwave (be sure to use a microwave-safe bowl and handle with care, stirring in 20 second increments until melted). When the green candy melts are partially melted, mix in the coconut oil. This will thin out the candy melts so that your mixture becomes smooth. Dip the bottom of each marshmallow (which is still uncoated) into the green candy melt. Allow excess to drip back into the bowl. Immediately dip each marshmallow into the green sprinkles and place onto the middle of the chocolate-covered cookies you made earlier. Repeat until all marshmallows are dipped in green chocolate and sprinkles, and attached to a cookie, in a hat shape. While the leprechaun hat treats are drying, scoop the remaining melted green chocolate into a plastic piping bag. If needed, re-melt the green chocolate first. 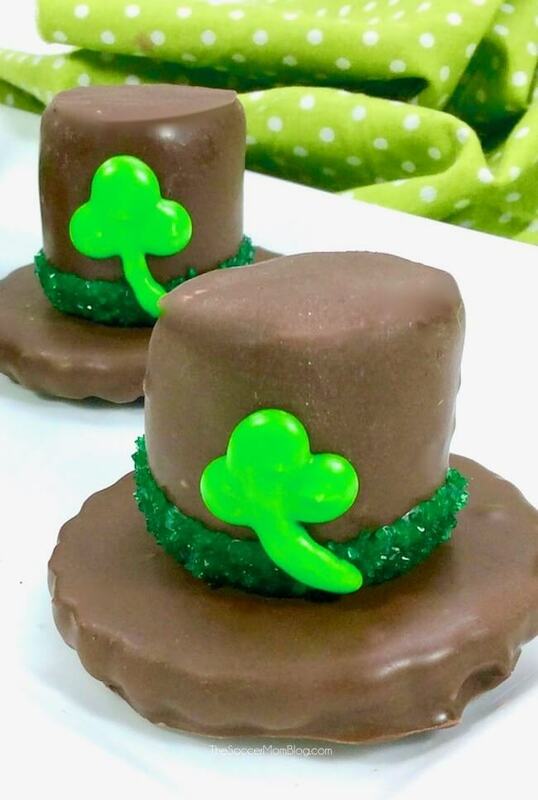 Using the green chocolate, draw 3 dots onto the middle of each hat. Use a toothpick, if needed, to connect them and make a shamrock.